How to Change Admin Panel Language in PrestaShop? 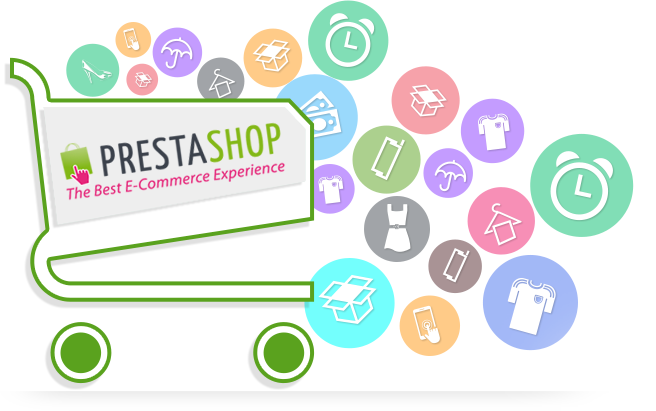 PrestaShop is an e-commerce solution which is open source and free to download and install. It is easy to install and set-up shop with the tutorial that is available as well as the detailed instruction that are provided. However there is more to PrestaShop that just the basic installation and usage. PrestaShop offers several additional modules that can be downloaded and installed on your shopping cart to supplement the functionality of the e-commerce website. In addition to which several levels of customizations are also possible on the PrestaShop. For example if you have a custom design in mind for you ecommerce website and want to implement it using PrestaShop then you would ideally need to hire a company that offers PrestaShop Web design services. PrestaShop has two faces to the website. One is the user side which the visitors use to make their purchases and view the catalog. The other is the admin side which the administrator generally uses to maintain the website and manage the products, order and customers that visit the website to make a purchase. It is necessary to keep the both separate due to security reasons. By having a completely different URL for both the user side and the admin side it is possible to restrict access to the admin side thus avoiding unwanted attacks or snooping visitors. The admin section has several features. For example it is possible to add all the products to the website. Once these products have been added and the site is operational it is possible to maintain the e-commerce website from this admin side by keeping track of the customers, making sure their orders are being processed smoothly. But this can be a very demanding task and you may want to assign it to someone else while you as the store owner can be busy building more such e-commerce websites. It is also possible to create users with different profile having lesser privileges in PrestaShop. Such user can be assigned the task of the daily maintenance that is required with the customers and their orders or even adding of new products or placing products on offer. But it is often the case that such helpers are not fluent in English or it may even be the case that you yourself as the store owner do not prefer English as the default store admin language. In that case Presta Shop conveniently offers a solution in the form of multiple languages for the admin side that can be setup as explained in the remainder of this article. In case of needing to change the language for one of your employees or it may be the case that you wish to change the language on your own profile. In that case you simply need to visit the admin menu link Administration –> Employees and click on your own profile listed there or that of your employee and edit it. You will find a field in the page that loads which allows you to change the language option of the admin side. It is possible to select another language from the drop down if it is available. If another language is not available or the language of your choice is not available then you will need to install the new language that you require first and then repeat the same process in order to change the language. 1. First visit the website http://www.prestashop.com/en/translations in a different tab or browser. Here you need to search for your language. Once you have found your language it is a good idea to make a note of the ISO Code of the language. You then need to select the version of your Presta Shop installation from the drop down box. The current version can be found on the admin side if you scroll all the way to the bottom and look at the bottom left side of your page. The current version at the time of writing this article was 1.5.4.1.This language pack can be downloaded by clicking the download button provided. 2. Extract the language file thus downloaded and place in a suitable folder for use later. 3. Go to the admin section of Presta Shop again and select the menu item Localization –> Languages. Click on the ‘Add new’ button on the right side of the screen and this will bring up a form to add a new language. 4. You need to fill and submit this form provided by Presta Shop in order to add a new language. The fields include the name of the language, the ISO code that you had procured in step 1, the language code which is similar to the ISO code in most cases, the date formats, the flag image (this is the image of the country like German flag for the German language), RTL option. 5. Once submitted you should see your new language listed on the screen. 6. Now comes the part when you need to use the file that you had downloaded. Go To the admin menu option Localization –> Translations this time and look for the section with the heading ‘Import a language pack manually’. Here you can browser your computer for where you stored the language pack and select the appropriate theme and hit the import button and you are done. 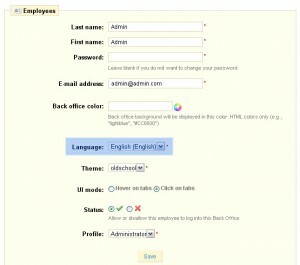 The above set of steps if followed properly will install the new language pack and thus when you visit the employee profile from the Administration menu as mentioned earlier you will find the option of your language which on selecting will change the admin language. The procedure to perform such action may seem to be a lengthy one but is in fact quite simple. Many companies offer PrestaShop web design and Alakmalak is one of the many that has been doing so since a while and is capable of providing you with the design of your choice as well. PrestaShop is a popular open source e-commerce website they is highly customizable. Thought it is best to leave most of the customizations to the professionals there are many features that are quite user friendly and can be performed easily by the store owner themselves. This includes changing the language on the admin side which can be achieved by following the simple steps provided on this article. How to change admin panel language prestashop? How to Add a Custom Links To PrestaShop Categories Menu?